In the world of cordless drills and drivers, the Bosch FlexiClick is like a Swiss Army knife. With its multiple functions and attachments, it makes for a very versatile tool. The 12V Flexiclick kit has been available in the European market for almost a year now, but it has just become available in North America. Bosch has made the model number a bit of a string of alphabet soup (GSR12V-140FCB22), so we'll just refer to it as the FlexiClick throughout this review. I was very excited to get my hands on the FlexiClick, since it's a tool that I've been wishing that Bosch would bring across to this side of the Atlantic for awhile now. It's a perfect fit for the cabinet work that I do and you'll see examples of that in this article. Bosch sent the kit out to me before it was available for sale so I could put it to work and test it out in exchange for an honest review. So we'll take a look at some of the features and specs of the FlexiClick, I'll share some of my thoughts and observations that I've made, we'll take a look at how I've been putting it to work and then I'll give it a DP Tool Score. When you buy the Flexiclick kit you get the drill itself, two 12V 2 Ah batteries, a right angle attachment, an offset attachment, a keyless chuck, a locking hex chuck, a charger, a soft zippered carry case, a couple driver bits and an instruction manual. I won't go through all of the detailed spec numbers because you can easily read through those on Bosch's website. I will mention a couple of the key spec numbers though. With 265 in/lbs of torque and a weight of about 1.8 lbs, the FlexiClick does have a good power to weight ratio. Its compact size, light weight and good power output only add to the versatility of the kit. Before we take a look at the attachments and functions of the FlexiClick kit, we'll take a look at the body of the drill itself. Like most drills now it has a built-in LED work light, but the feature that I really appreciate is that the light stays on for 10 seconds after you let go of the trigger. It's nice not to lose light when you let go of the trigger when working in darker situations. Like the rest of the Bosch 12V drills, the FlexiClick has a 3 level LED battery power indicator on the side of the drill to let you know how much juice you have left. 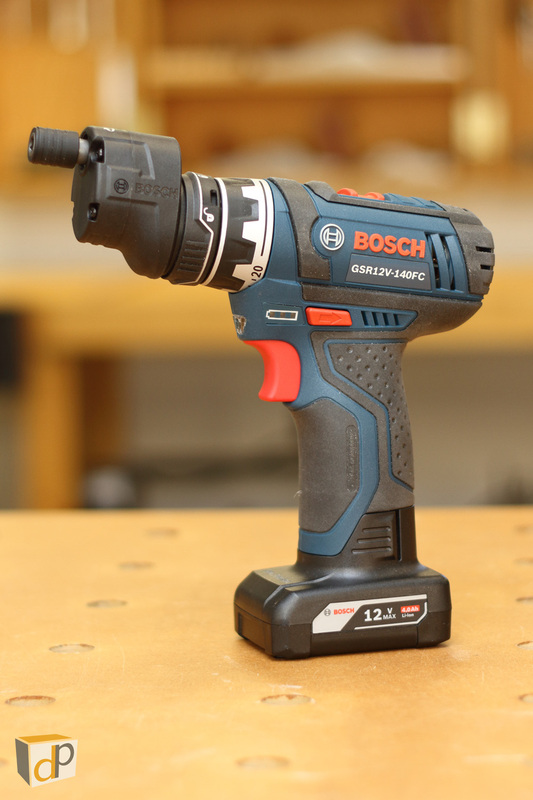 The body and grip of the FlexiClick are pretty much identical to the older Bosch PS31 so it is built on Bosch's older drill architecture rather than the newer models. I was disappointed to find out that the model of FlexiClick that we got here in North America doesn't have a brushless motor. It seems to share motors as well as the body with the PS31. From what I've seen, it looks like the 18V FlexiClick model available in Europe has a brushless motor so I'm not sure why we didn't get one here in the 12V model since it is a new tool to us. So while the body, grip and motor of the FlexiClick aren't anything new or exciting, the interchangeable heads definitely are. Bosch calls the mounting system their 'One-Click interface' and I've found it to be very easy to use. The closest thing I can relate it to is a bayonet lens mount on a camera. If you've shot with an SLR or DSLR then you'll have a pretty good idea of how the mounting system on the FlexiClick works. To mount any of the 4 heads you simply line up the mounting points, push the head on and turn the locking ring until you hear a click and see the indicator in the locked position. To see this in action, make sure you watch my full video review. Bosch calls the FlexiClick a 5-In-1 Drill/Driver System, so we'll go through each of the 5 functions and I'll share my thoughts about each one. The first and most basic function is the magnetic bit holder built in to the front of the drill body. This bit holder won't lock a bit in place and just relies on a magnetic hold so it works well for quick, basic driving tasks. It also works well when you need to keep the head length as short as possible for getting into tighter spaces. This bit holder is also what drives the hex drive shafts on the 4 attachment heads. The second is the right angle attachment which excels at getting into tight spaces that the drill itself won't fit into. There are quite a few different right angle attachments on the market that you can use with any regular drill, but having one that integrates with the drill is better from what I've found. One reason is that an integrated right angle attachment is designed to handle the full torque of the drill and I'll talk more about that later. Another advantage is that the body of the right angle attachment doesn't rotate freely like an add-on one does. The right angle head on the FlexiClick will adjust to 16 different positions in 22.5 degree increments so it can be positioned to where it works best. It simply pulls outward and then can be rotated and locked back in to whichever detent you choose. Any of the other 3 attachments will also attach to the right angle head for increased versatility. Third is the regular keyless chuck for normal drilling tasks. The chuck has a 3/8" capacity so it will handle most light to medium duty drilling jobs. I found that the grooves in the sleeve of the chuck are extra deep so it's easy to get a good grip on it for tightening it down on bits. Fourth is a normal locking hex chuck for standard driving bits. This is what you'll find on most drivers and impact drivers and is the head to use when you want a more secure hold on the driver bit than what the magnetic one will provide. The fifth attachment and the one I was the most excited about is the offset head. In my opinion I think this is the FlexiClick's most unique feature and the one that really sets it apart from most drill/drivers. The offset head allows you to drill or drive very close to an adjacent surface which is very helpful in a lot of situations. The center line of the offset head's hex chuck can get as close as 7/16" away from an adjacent surface compared to 1-1/16" for the drill itself. So at 5/8" closer, this attachment makes a significant difference in how close you can drill or drive. The offset head can also be rotated to 16 different positions the same as the right angle head. I wanted to share a few of my more random thoughts and observations that I've made during the time that I've had the FlexiClick so far. If you watched my video review and came to the article to find out more of my thoughts and observations, then this is where you'll find them. First off I noticed that the locking hex chucks on both the offset attachment and the regular hex chuck attachment pull in to release or insert a driver bit. Every other driver that I own or have used has a sleeve that pulls out. I'm not really sure why Bosch made these ones different but they seem to be opposite to most others. While it's not a huge deal, I've found that it takes a bit of getting used to remembering to pull in rather than out. If you happen to have the Bosch 4.0 Ah 12V battery, then the FlexiClick will stand up with any one of the attachments mounted on the drill. Depending on where and how you are working this can be a handy feature. Now if you combine two of the heavier attachments, for example the right angle and offset, then even with the 4.0 Ah battery the FlexiClick will fall forward. Using two attachments together like this does make the drill feel front heavy and so I usually end up using a two handed grip just to balance things out. 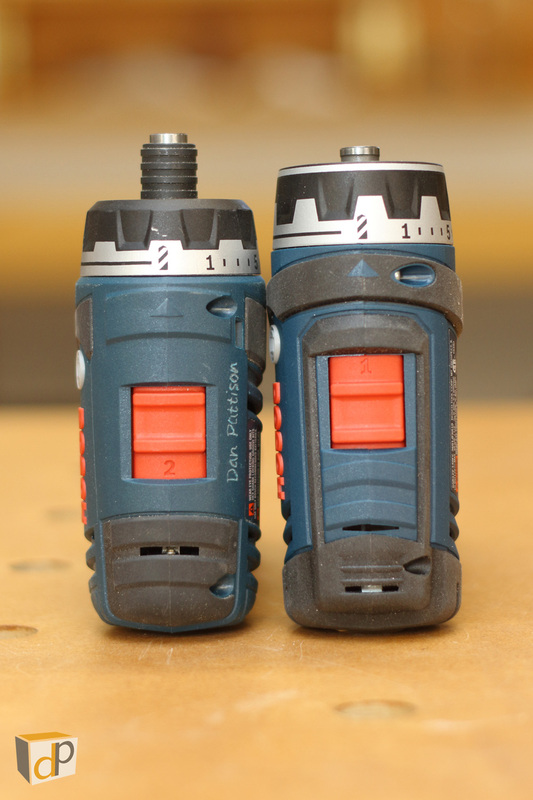 If the drill doesn't have any attachments on it, it will stand up just using the standard 2.0 Ah battery. I also made a few size comparisons between the FlexiClick and the Bosch PS31 and PS22 for anyone that has those models and wants to see how they compare. When it comes to head length, the FlexiClick with the keyless chuck mounted is 3/8" longer than the PS31. I think this difference comes down to the space that the locking ring and interface plates take up on the FlexiClick system. If you compare head lengths between the FlexiClick and the PS22, the FlexiClick is 3/16" shorter but only when there is no attachment mounted and just the magnetic bit holder is used. If you mount the locking hex chuck on the FlexiClick it becomes 7/8" longer than the PS22. So the takeaway from these comparisons is if you have the dedicated drill (PS31), or dedicated driver (PS22), they will still get you the shortest head length compared to using the comparable attachment on the FlexiClick. Strip the FlexiClick down to the magnetic bit holder though, and it does give the overall shortest head length. One other side note when comparing these 3 drill/drivers is I do prefer the older style grip on the FlexiClick and PS31 compared to the PS22. Something that I didn't have time to mention or explore in the video but wanted to cover is the ability to remove and clean the metal interface plates. I tried removing the 3 small Torx head screws from the interface plate on the drill itself and the plate easily comes off. The same is true for the interface plate on the end of the right angle attachment where the other attachments can be mounted. The reason I was curious about this is for cleanability. I generally keep my tools pretty clean but if the inside flanges on these plates were to get jammed up with dirt or sawdust over time then it would be easy enough to take the plates out and give them a good cleaning. The other thing I discovered when I removed the interface plates is that the internal components ride on standard metal ball bearing cartridges. As a professional cabinet maker and finish carpenter, I've been putting the FlexiClick to use both in the shop and on site. It has proved to be a perfect fit for the type of work that I do and has impressed me with its versatility. I recently installed a quick prefab kitchen for an apartment renovation job that I was working on and put the FlexiClick to work. I used it for screwing the cabinet boxes together, fastening them to the wall, drilling for and installing hardware as well as installing the crown moulding. The two places where the FlexiClick really stood out was driving screws tight to the underside of the countertop attachment cleats using the offset attachment and installing the crown moulding using the right angle attachment. The FlexiClick had plenty of torque to drive the #8 x 3" screws to mount the cabinets to the wall. I even tried using both the right angle and offset attachments to drive those screws and they drove just as strong as the drill itself. For installing hardware, I tried setting up a drill bit in the keyless chuck attachment and a driver bit in the locking hex chuck attachment and was able to quickly and easily switch between the two operations. When it came to using the FlexiClick in the shop, I wanted to further test its abilities. One thing that I've always found to be awkward to do is install those small two-hole angle brackets. With a regular drill/driver you can never really drive the mounting screws straight since the diameter of the head of the drill forces you to drive at an angle. Using the offset attachment I was able to easily pre-drill for and drive the screws. I also wanted to test out the low end grunt of the FlexiClick. To do that I tried driving #10 x 3 1/2" screws into framing lumber as well as drilling holes through framing lumber with a 1" spade bit. I tried both of these tests using just the drill itself and then tried the right angle attachment and offset attachment. In all cases the FlexiClick sank the screws with no issues at all and also ran the spade bit with no issues. Since the right angle and offset heads obviously have gears inside to change drive direction/axis I wanted to see if there were any weaknesses in them or limitations to the torque that they would handle. From what I found in my tests, anything that the drill itself will do can also be done with any of the attachments which was important to me. To see all of these tests and real world uses in action, make sure you check out my full video review. For quality I'm giving 5/5 stars. Everything is solidly built with great fit and finish. The attachments have a good weight to them and feel like they have solid construction. The attachments have a tough plastic outer shell that almost feels like metal and the internal drive components are all metal. The FlexiClick kit definitely feels like a professional quality tool. For performance I'm giving 5/5 stars. The FlexiClick handled all of the tasks and tests that I put to it with no issues at all. It has both the torque and the finesse to get a wide variety of jobs done. Add in the versatility of the interchangeable heads and you can tackle a lot of different situations. I also found that it had good run time on the standard 2.0 Ah batteries that it came with. For design I'm giving 4/5 stars. It was definitely disappointing to see that the FlexiClick in North America didn't get a brushless motor, since just about everything is going brushless now. From what I can tell, the FlexiClick shares motors with the older Bosch PS31 drill. I've had my PS31 for over 6 years now and it's seen a lot of use and is still going strong. So if that's any indication, no it's not a brushless motor, but it does seem to be a good motor. The hex chuck sleeves pulling in rather than out is a bit strange but not a huge deal. On the positive side, I think the FlexiClick kit as a whole is an excellent design that is extremely versatile. The 'One-Click Interface' was well designed and executed, and is quick and easy to use. For value I'm giving 5/5 stars. For the cost of the kit you definitely get a lot of functionality and versatility. It really is like having several drill/drivers in one which makes it great value for money. The only other comparable professional quality kit in North America that I know of is the Festool. With the Festool kit being several times the price of the FlexiClick, that again makes the FlexilClick good value. It would be nice to see the FlexiClick come with a more substantial case than the soft zippered case that it comes with though. I use the L-Boxx system for all of my gear, so I don't use the included cases, but for those that do it would be nice if it came with a hard case. So with an overall DP Tool Score of 4.75 stars out of 5, the Bosch FlexiClick comes highly recommended. 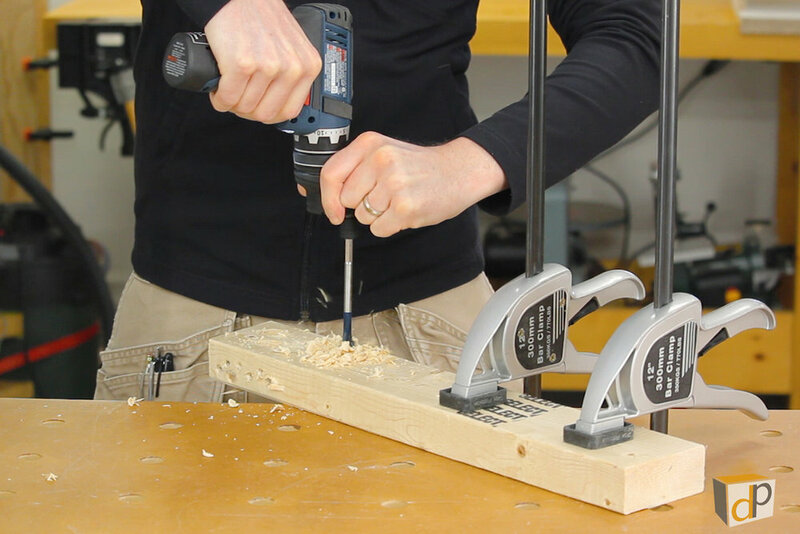 Whether you're a professional looking to add a versatile kit to your existing collection of drills and drivers, or you're a DIY homeowner looking for one drill to cover a wide variety of tasks, I think the FlexiClick is definitely a winner. No, it's not going to replace 18V drills and impact drivers for more heavy duty tasks. But for the vast majority of normal drilling and driving, the FlexiClick has plenty of power. And with the right angle and offset attachments, it allows you to get into tight spaces that just aren't possible with most other drills and drivers. It's those two attachments that I think really set the FlexiClick apart, and make it special. My name is Dan Pattison and I am a self-employed builder and designer from Halifax, Nova Scotia, Canada. The majority of my local work consists of custom kitchens, built-in cabinetry, trim work and finish carpentry. I enjoy the design and build process and the satisfaction that comes from building things with my hands. My interest in woodworking was sparked by a junior high woodworking class where I was fascinated by the band saw. I was determined to get my own band saw and started my own small woodshop in my parent's basement. My skills and tool collection grew from there and has brought me to where I am today. I am always trying to come up with better and more efficient ways to work. My Multi Purpose Table (MPT) design came from my desire for a more efficient way to work along with being able to build it myself rather than buying something commercially made. A result of the Imagine-Design-Build process. I enjoy sharing my ideas with others through digital media. My YouTube show 'DP Shop Talk' was created for that purpose and focuses on shop made efficiency solutions. I have a passion for the work I do and I hope I can pass that passion on to others as well.